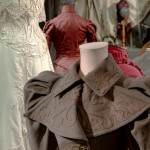 Astrida Schaeffer has been making reproduction historical clothing since 1986 and museum mannequins since 1998. She managed collections at the Museum of Art, University of NH for ten years and learned the craft of carving mannequins at the Textile Conservation Center in Lowell, MA. Her background in researching and making historical reproductions gives her a deeper understanding of what each garment needs in its mannequin in order to look its best. In addition to working with museums and historical societies in New England and beyond, she has curated a number of costume exhibitions, most recently Embellishments: Constructing Victorian Detail; a forthcoming book of the same name is due to be published in 2013. Her mannequin work has also appeared in Thread, Stories of Fashion at Strawbery Banke, 1740-2012 (Strawbery Banke Museum, 2012), Encyclopedia of Clothing and Fashion (Charles Scribner’s Sons, 2004) and Cherished Possessions (Society for the Preservation of New England Antiquities, 2003), and was featured in the Historic Fashions Calendar series. She is a member of the Costume Society of America and the New England Museum Association.